There are plenty of books on the market bemoaning the sad state of the mainstream fashion industry from working conditions to the life-cycle of the average fast fashion garment. And while they are all well-written, carefully researched, and offer inspiration to change our shopping and fashion habits, most of them fall short on two counts – first because they are seldom written by someone with a first-hand, working knowledge of the apparel industry, and second, because while the suggestions for change are well-intended, they aren’t based in practicality. 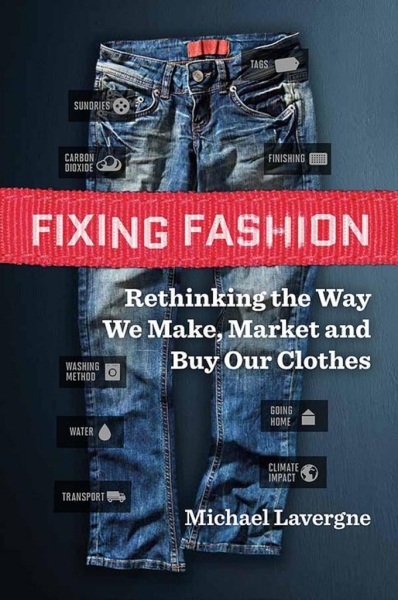 Fixing Fashion by Michael Lavergne (Amazon) offers a different perspective. Lavergne made his start in the fashion industry working for corporations such as WalMart, and the apparel arm of Sara Lee. He specialized in product sourcing and supply chains (getting all the material to the right place at the right time and then getting the manufactured goods to stores halfway across the world in a timely fashion), and became an expert in labour and safety standards as he witnessed contractors and sub-contractors ignoring local laws (and corporate standards) regarding everything from wages to child labour to building codes. In an industry where cost – and keeping it low – is often the deciding factor when choosing manufacturers, Lavergne witnessed a variety of unethical practices. In 2005, he moved out of the corporate sector to become an ethical supply chain professional at WRAP (Worldwide Responsible Accredited Production), a US-based organization that helps to enforce local labour standards. Lavergne details the process of garment manufacturing in an offshore setting – showing how many companies start out with the best intentions in terms of having their goods made ethically only to have contractors and sub-contractors, each working for a smaller and smaller slice of the pie, cutting standards to ensure a profit. Codes of conduct are signed but not adhered to. Agents, responsible for ensuring the goods are ready on time, also act as inspectors, tasked with ensuring ethical and safety standards are met – something most definitely not considered best practice, as their vested interest makes them ripe for corruption. Besides labour and safety practices, Lavergne also explores environmental issues, such as the dumping of dyes and chemicals. While Fixing Fashion could be just another tale of woe, advising readers to learn to mend and buy more vintage (neither of which are bad things, really), Lavergne instead takes the time to give props where they are deserved, singling out both manufacturers and retailers who ensure standards are met – who knew that H&M leads in transparency and sustainability and is the #1 consumer of organic cotton? Lavergne’s opinion on what needs to be done – better oversight via organizations such as WRAP or FLA (Fair Labour Association) – is obvious and reasonable given his background, and will ultimately do more for the cause than individual consumers boycotting stores. He also takes the time to recognize individuals making a difference within the industry – the final chapter, Redefining Fashion, is a collection of vignettes/bios of educators, designers, manufacturers, corporate presidents, event organizers and activists all working in their own way to make the industry better. From The Alliance for Bangladesh Worker Safety to representatives from Eileen Fisher and Adidas, to Sarah Power, creator of the Canadian indie fashion event Inland, Lavergne profiles people making a difference and offering solutions. Fixing Fashion might be a tough, slightly dry read for anyone not thoroughly interested in the fashion manufacturing process. Most people don’t spend much time thinking about where their clothing comes from, and when they do, because of unfortunate events such as Rana Plaza, they quickly forget as soon as something in the shops catches their eye, especially when efforts on a personal level seem so fruitless – even people who sew their own clothes eventually need socks and underwear, and good luck finding anything of the sort that is both affordable and made locally. Lavergne is clear on the solution – it’s not to stop working with overseas manufacturers, at least not if our desire for cheap clothing is to be sated, but to actually enforce safety, environmental and labour laws via a variety of organizations, that will create clothing that is ethical and sustainable. This post originally appeared on the alternative pop-culture website, Vermicious.